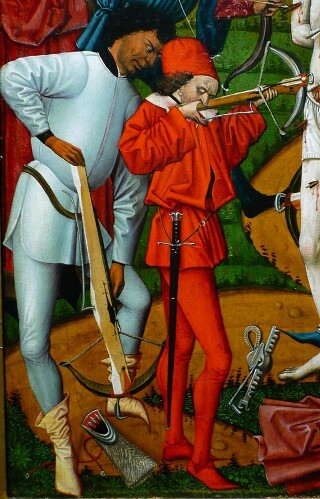 The crossbow has been around since ancient China and Athenian Greece. 5th century BC, if not longer. It’s one of the original Great Ideas, and an obvious one to anyone who has ever drawn a bow and held the draw, and held it, and held it, and ... OMG, my arms are killing me, can’t we find a better way to do this? Hey, how about we put a stick on it, right, with a latch on the back to hold the string, and a little doo-dad thingy to release it? And that worked, mostly. Except that the arrows kept falling off, so Smart Guy #2 turned the bow from vertical to horizontal, carved a groove in the stick to rest the arrow on, and the rest, as they say, was history. Ok, well nearly. Smart Guy #3 found that trying to move about with 3 feet of bow sticking out to your left and your right was a pain, so they went with much heavier bow limbs that were less than half as big. And then the rest was history. Archery as a whole has seen a revitalization in the past 3 or 4 decades with the invention of the eccentric cam (aka nautilus wheel), which allows bows to be made shorter and stiffer, reduces the effort needed to draw them, and results in considerable increase in arrow speed. And that means lots more power. Modern “compound” bows can zip an arrow downrange at about 350 feet per second (fps), which is nearly 100 fps than traditional bows. Crossbows also adopted this technology, and these days it is hard to find a crossbow on the market that isn’t a compound design, with split limbs and big cams on the ends, and wires criss-crossing all over the place. But it works. And now nearly all the problems of crossbows have been solved. Except two. Because the short heavy bow is still attached out at the front end of the stick, they are still front heavy. And the short limb design still forces them to use tiny arrows, which on crossbows are called bolts or quarrels. From which we get the old expressions “you’ve shot your bolt” (crossbows being notoriously slow to reload) and “are you trying to pick a quarrel with me?”. Ok, maybe not so much the last one. Welcome to the future. A company called Scorpyd has just ( 2009-ish ) reinvented the crossbow. By building one backwards. It looks like a joke, like an inept child’s drawing brought to life. But it works. They put the bow limbs on backwards and towards the back for balance, and the thing draws inward not outward. Duh!! But this gives the bowstring lots more travel distance, and that lets them shoot much longer bolts, nearly as long as regular arrows. And they shoot much faster. Way faster. Pushing 450 fps with a 400 grain bolt. Which makes this the fastest bit of archery kit on earth. It’s wicked accurate too. Naturally, all it takes is money. Lots of money. These radical new crossbows sell for over $1500.